dance.net - Dress Purple Longniddry Kilt Outfit (10244478) - Read article: Ballet, Jazz, Modern, Hip Hop, Tap, Irish, Disco, Twirling, Cheer: Photos, Chat, Games, Jobs, Events! 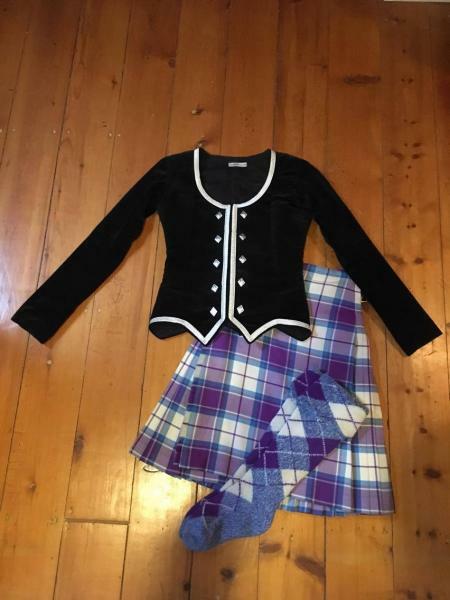 Dress Purple Longniddry Kilt Outfit for sale. Please don't hesitate to message if you have any questions or are looking for more measurements/pictures. Would you be willing to sell items separately (I'm interested mostly because of the jacket, but I know the socks will probably not fit me)? yes we would sell the jacket separately, it would be 200.00 plus shipping, it is like brand new condition. Hi there, I pm you. I'm interested in the kilt and socks, if you'll sell separately. I sent you a pm. What age was your daughter?? My daughter was a slight 19 year old when she wore this and then she stopped dancing to pursue her career in nursing.